It was part of the war effort to gather rose hips and turn them into syrup for use as a vitamin drink to prevent scurvy in the population, especially in children, during the Second World War. 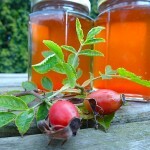 Boil 2l water add cleaned rose hips then bring to boil and leave for 15 mins. Drain juice through a jelly bag and put remaining pulp back in the pan. Add the 1 litre of water and bring to boil, again leave for 10 mins after boiling. Strain again through jelly bag and pour the strained juice into pan and boil. Reduce until you have 1 litre of liquid. Once reduced add the sugar and stir until dissolved. Funnel the syrup into sterilised jars or cool and freeze. 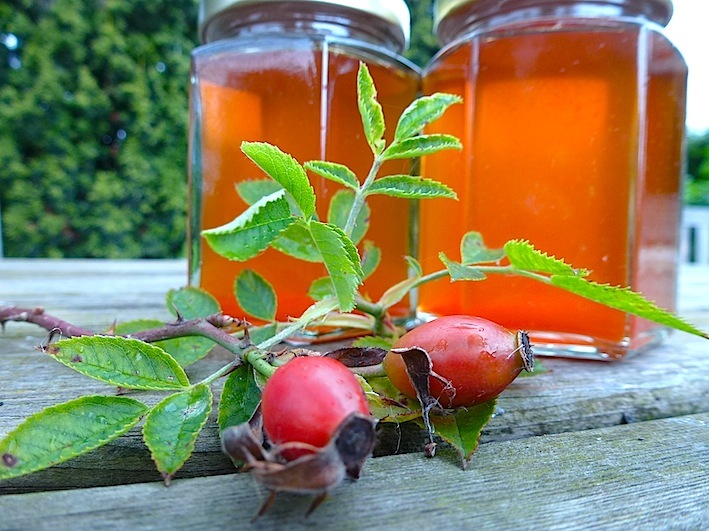 Rose hips have been eaten since ancient times. In the mediaeval times wild roses were grown in monasteries as a medicinal herb.